Sumi Mini Brick glass tiles are a popular style of kitchen backsplash tile that are created from blending complementary and contrasting colors.These types of tiles are notable for featuring delicate, feathery brushstrokes that are inspired by Japanese brush paintings. In addition to providing a rich mosaic of color, Sumi Mini Brick tiles are extremely soothing to view in person as they create a slight optical illusion resembling softly flowing water. Due to the large variety of color options available, Sumi Mini Brick tiles can be used as backsplash tile in almost any style of kitchen. One of the reasons Sumi Mini Brick glass tiles are one of the most popular items we carry at Transworld Tile is because the contrasting colors used to create Sumi Mini Brick tiles help the tiles match your San Fernando home’s existing style. The colors in the tiles that are complimentary to your kitchen floor tiles will cause those colors to blend together harmoniously. 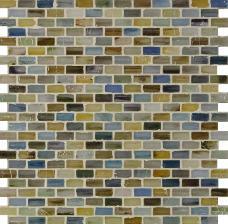 Additionally, the contrasting colors will provide a bit of accenting as your kitchen backsplash. When these design elements are blended together, these tiny bricks create a huge impact. Glass tiles are one of the most popular kitchen tiles currently on the market, and sumi mini brick tiles are an excellent choice for your kitchen tile backsplash. The blend of contrasting and complimentary colors helps Sumi Mini Brick glass tiles look great with your home’s existing style. At Transworld Tile, we make sure the glass tiles you want will look great in your home; that’s why we are California’s Top Rated Local® tile & design service. If your San Fernando home could use a splash of color in the kitchen, Sumi Mini Brick glass tiles could be the answer you’ve been searching for. Contact us today to learn more!